Create a task management app. what does the research show about how these apps are being used? is there any need that isn't being met or is there any niche that can be filled? Task management apps tend to fall into two broad categories: to only preform one task, like blocking websites, giving reminders or allowing users to take notes. Or, they preform multiple, more complex tasks, like allowing users to share tasks, edit calendars, make notes on tasks or sort them into folders. Visually speaking, many are either card based, which can become cluttered and overwhelming or have long lis style menus and navigations which can become repetitive and confusing. A study done by iDoneThis showed that 41% of tasks placed in users systems never get completed, why is this? The longer the list, the less is accomplished, people get overwhelmed by the amount of tasks they need to accomplish in such a short amount of time and our brains just can't keep up. This is doubly frustrating for individuals with ADHD who suffer from short attention spans, poor short term memory and have trouble concentrating. Digging a little deeper into this, another study (Newman et al., 2011) "...found that only 20% of college students with a diagnosis who got accommodations and help in high school informed their universities of their disability status. Of those who did, only 19% used the resources available." Why not create an app that could help students with ADHD keep track of assignments and tasks on their own if they aren't using university resources? 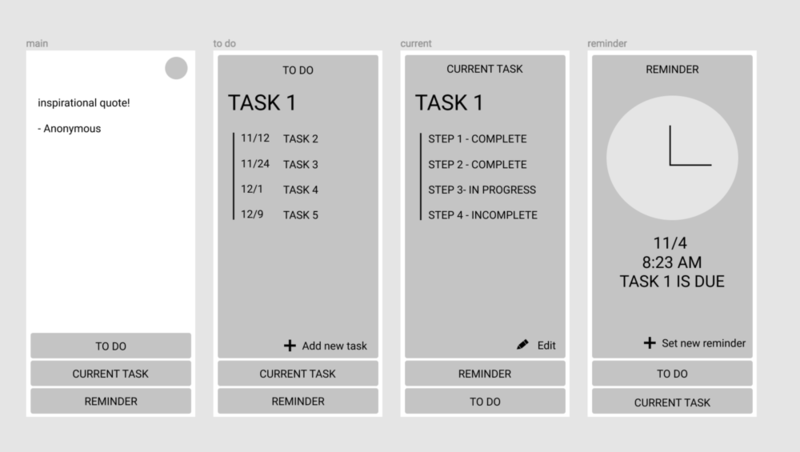 having a very focused, simple layout that dials into simple, straightforward tools that help address the most major frustrations with keeping track of work and staying on task. Anxiety can also be a component of ADHD, especially when deadlines are looming, so I introduced the concept of a small “buddy” or character to offer encouragement or reminders to the user. After user testing, I found that the character was too distracting, as well as finding out that the users with ADHD I interviewed tended to only use one or two features offered, such as a to do list or a reminder system. Many users also expressed a desire for simpler layouts or experiences, without so many options or clutter. Study Buddy went through several iterations before aha finally settled on a clean, simple application with 3 core features: To Do List, Reminders and Current Task. UX research, sketching, wireframes, UI design, prototyping.